100th visit to Washington Hilton by a sitting U.S. President. at a meeting of the North America's Building Trades Unions. by a gunshot fired from John Hinckley, Jr., who had been waiting outside. D.C. police officer Thomas Delahanty, and Secret Service agent Timothy McCarthy. 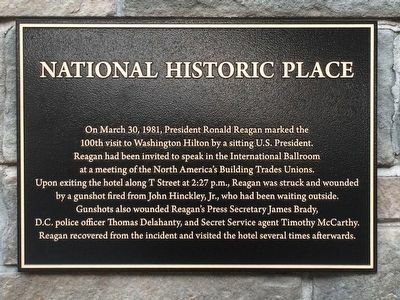 Reagan recovered from the incident and visited the hotel several times afterwards. Location. 38° 54.968′ N, 77° 2.723′ W. Marker is in Adams Morgan, District of Columbia, in Washington. Marker is on T Street near Columbia Road NW, on the right when traveling west. Touch for map. 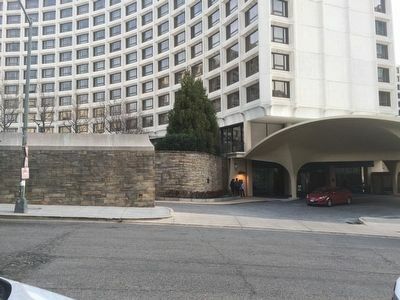 The marker is to the left of the Washington Hilton lower level entrance on T Street. Marker is in this post office area: Washington DC 20009, United States of America. Touch for directions. 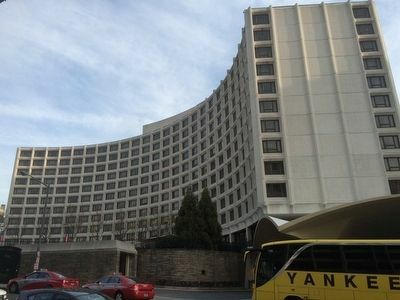 The Washington Hilton Hotel. The marker is along the stone wall seen in the lower middle of this view. (about 400 feet away, measured in a direct line); General Manuel Belgrano (about 600 feet away); Embassy of the Republic of Malta (about 600 feet away); "Best Addresses" (about 700 feet away); Architects and Architecture (about 800 feet away); Educational Institutions (approx. 0.2 miles away); Building a Better Neighborhood (approx. ¼ mile away). The marker can be seen roughly in the center of the photo. Previously the door where Reagan left the hotel was to the left of the marker, where a new stone-faced vehicle entryway has been constructed. 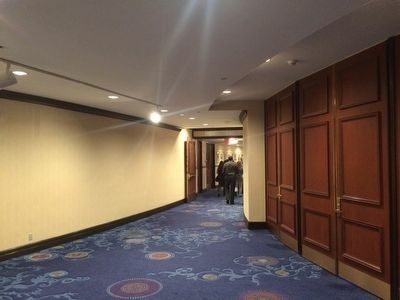 Reagan walked along this passage inside the Washington Hilton as he exited the hotel on March 30, 1981. Interestingly, it had been built into the hotel's plans after President Kennedy's assassination as a protective feature for the hotel for visiting dignitaries. More. Search the internet for President Reagan Assassination Attempt. Credits. This page was last revised on October 22, 2017. This page originally submitted on March 22, 2016, by J. Makali Bruton of Querétaro, Mexico. This page has been viewed 635 times since then and 16 times this year. Photos: 1, 2, 3, 4. submitted on March 22, 2016, by J. Makali Bruton of Querétaro, Mexico.